There’s another new update on the troubled Crow reboot. Get a look at Seth Rogen’s Last Starfighter-esque new comedy for Hulu. The Gears of War movie has a writer. Plus, what’s to come on Lucifer and Gotham, a new snifter of Wonder Woman footage, and another new song from the Once Upon a Time musical episode. Spoilers! A new video from Nerdist claims the film begins with Snoke “facing off” against a captured General Leia. 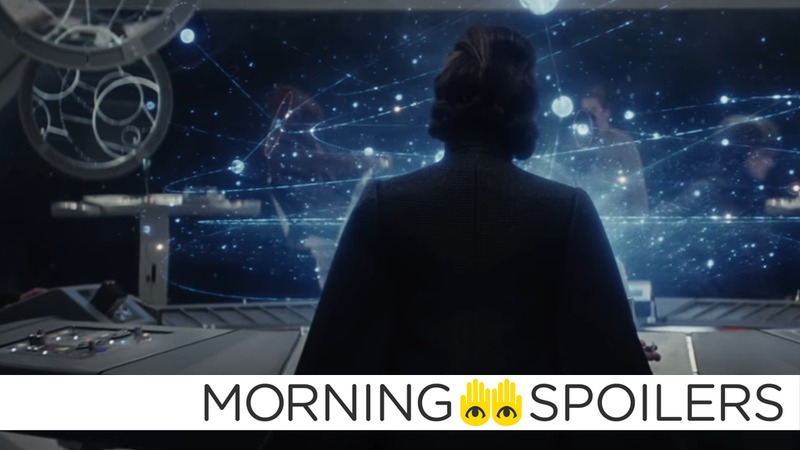 The scene allegedly concludes with Snoke informing General Hux to tell Kylo Ren that his mother is aboard Snoke’s lavish capital ship, which could indicate that a Kylo Ren/Leia meeting is on the cards—rumored to be one of two potential scenes that would make for Carrie Fisher’s final appearances in the Star Wars saga. Given that the original reporting in that scene made it sound like one such scene would be in The Last Jedi, and the other in Episode IX (which we now know Fisher will not be part of), this rumor seems to imply that the other scene—Leia’s reunion with her brother Luke—may tragically never occur. However, given that the original source of Nerdist’s report is a contextless Reddit user’s alleged dump of the first act of the film, it’s best to treat this all with a pinch of salt. Speaking of Star Wars, John Boyega confirms Finn survives to star in the third movie in the trilogy, much to the surprise of... no one? Warner Bros. has released a new Aqua-logo. Current producer and former director F. Javier Gutiérrez spoke to Forbes about the current, R-rated state of troubled Crow reboot. With The Crow, I haven’t talked to them in a while so I don’t know what is going on with that, but we are going to do an R-rated movie. I come from Europe, I’m very dark so I’m going to go for it. If any movie has to be R-rated then it’s The Crow. That’s how I got James O’Barr, the creator of The Crow, involved in the project because he said that if R-rated is the way that I wanted to go, he’s in. Even though I’m not directing it now, when I was going to be doing that I explained to the producers that they had to read and understand the comic book and not make the film a PG-13 version because it would make no sense. Some movies are for young people, I get it and maybe you can do it, but this movie is not necessarily for those young people and toning it down would give you a ghost of what The Crow should be. Wonder Woman plays bullets and bracelets in the latest poster, courtesy of Coming Soon. Also, here’s another new TV spot, with a smattering of new footage. A new clip features full-body convulsions and spinal protrusions. Suffice to say, you might wanna be a little careful if viewing this at work, but it’s not too bad. You know, protrusions aside. Transformers News spotted this new poster of Optimus Prime—with a very Knight-ish design—and a bowing Bumblebee. Temple Shaman reveals his hand to Bruce Wayne and sets up the next phase of training. Gordon and Bullock are put into danger as they come across a crystal owl that reveals the most coveted secrets of Gotham’s underworld. Meanwhile, Nygma and Penguin are forced to work together to get out of a tricky situation. When the man who had the final piece of the Flaming Sword is murdered and the piece goes missing, Mom joins Chloe and Lucifer on the case to track down the killer. But when Lucifer gets sidelined, Maze recruits him to help save Dr. Linda’s endangered career and confronts him about the secrets he’s been keeping. Here’s a press release for Jamie Mathieson’s episode, “Oxygen,” which features monetized breath and zombie astronauts. Khary Peyton teased the return of King Ezekial in a new photo on Twitter. Hulu released our first look image of the cast of Seth Rogan’s new scifi comedy series Future Man at yesterday’s reshoots.